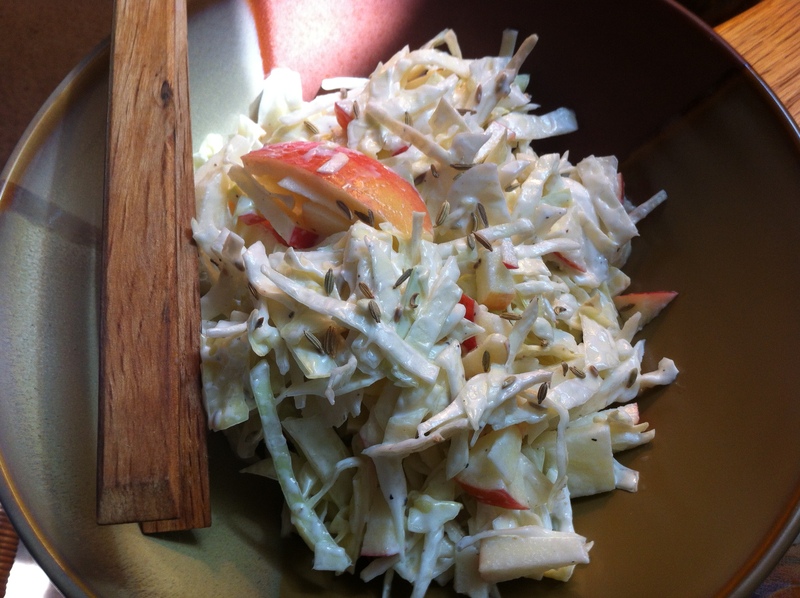 This simple vegan slaw contains wonderful medicinal healing ingredients, and a fresh, light flavor. With six ingredients, and about ten minutes prep time, it’s quick to prepare for a picnic or side. I’ve been experimenting cooking with organic lemon oil – usually reserved in the past for flavoring baked goods. I’ve tried it with steamed asparagus and now this slaw (along with Vegenaise, the amazing dairy and egg free substitute for mayonnaise). I find it gives a depth of concentrated citrus delight that is lilting, rich, but subtle. Fennel seed is so helpful for the digestion, and toasting it, then grinding in a mortar and pestle expands and helps to incorporate it’s flavor into the slaw. And Pink Lady apples….. my winter into spring love affair true confession…changing “an apple a day keeps the doctor away” to easily two. Crisp and the perfect balance between tart and sweet… IMO … Then cabbage, that wondrous orb of purifying, cleansing good stuff. Making this recipe a perfect spring tonic in many ways. Thinly slice, then chop cabbage. 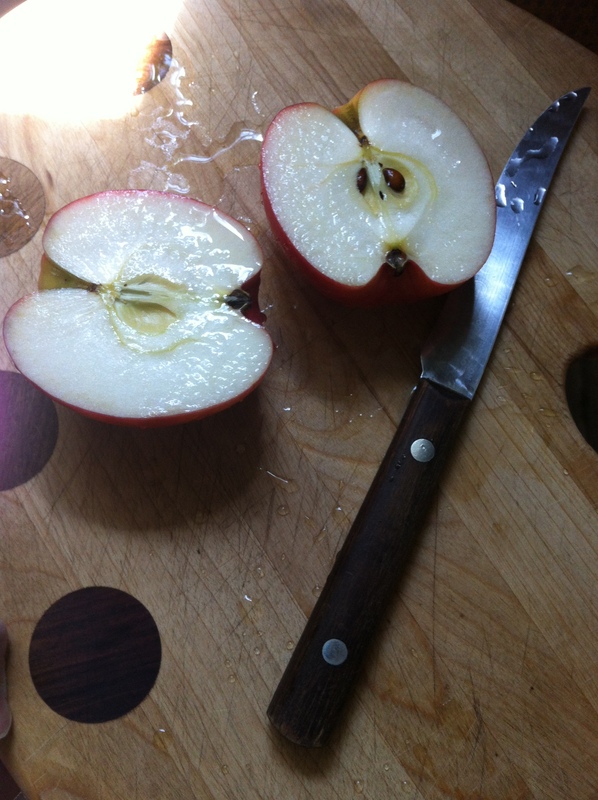 Halve, core, thinly slice, then chop apple. Place in large bowl and add vegenaise. 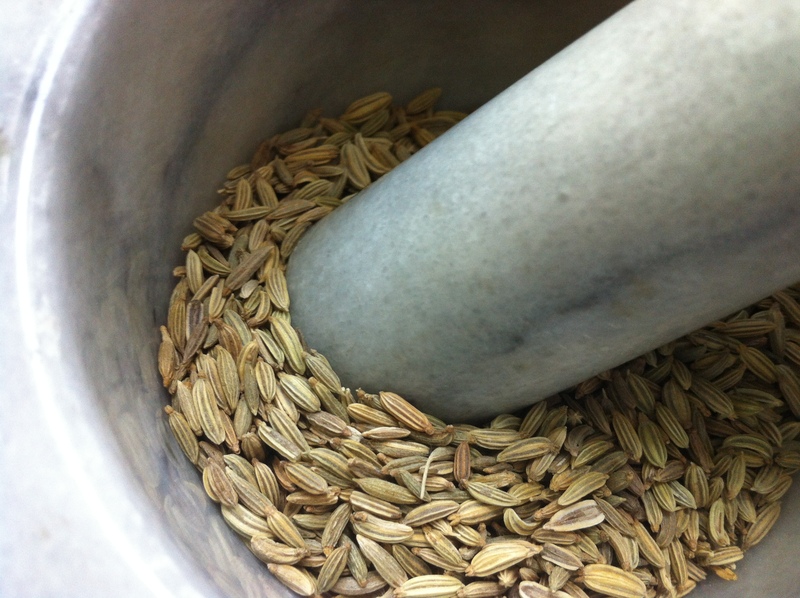 In a small dry skillet, toast fennel seed over medium heat until fragrant and lightly browned. Pour into mortar and pestle or small grinder and crush/grind coarsely. Add to bowl along with the lemon oil and some generous grinds of fresh pepper. Stir to blend, let sit for a few minutes, taste and adjust seasonings. Refreshing! Delicious! Try it….